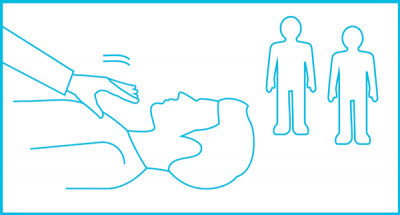 What should I do if I see someone collapse on the ground or find someone lying on the ground? 1. Can you wake the person up? Speak to them and shake their shoulders. 2. 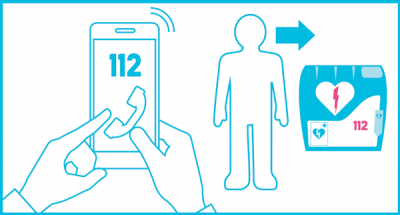 If the person does not wake up, call 112 and follow the instructions given by the emergency response centre staff. Turn your phone speakers on and continue helping the person. Check whether the person is breathing normally. If not, start cardiopulmonary resuscitation (CPR). If there are several helpers present, send one to bring a defibrillator. 3. 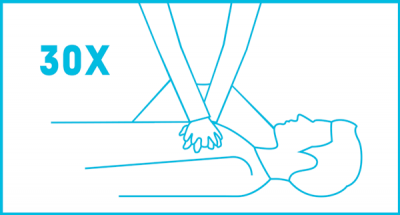 Perform 30 firm and quick chest compressions by pressing on the middle of the person’s chest. Then give two rescue breaths if you can. Watch and listen to the right beat for CPR. 4. Start the defibrillator and follow the instructions given by the device. 5. Expose the person’s chest and attach the self-adhesive electrodes as shown by the images. The device will then indicate whether a shock is needed. If the device says “irti potilaasta” (“move away”), you should stand clear and press the flashing shock button. 6. Continue giving CPR immediately after the shock. Keep the electrodes attached and continue giving CPR until the device gives further instructions. Continue giving CPR until the person wakes up or the emergency services tell you to stop. Check more detailed CPR instructions and watch a video on giving CPR on an adult. Practise and revise your CPR skills regularly. A first aid course will increase your confidence. If a person’s heart stops, they need immediate assistance. In adults, a cardiac arrest (stopped heart) is usually due to coronary heart disease or some other kind of heart disease. The most common arrhythmia (heart rhythm disturbance) stopping blood circulation is ventricular fibrillation (VF). In such cases, you should start resuscitation and find a defibrillator as soon as possible. If a person’s heart stops, the first person to help is usually someone passing by. 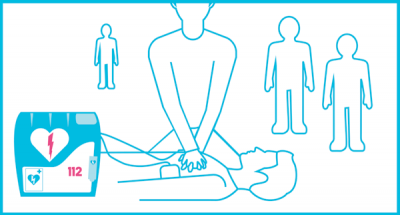 It is therefore a good idea to know the basics of cardiopulmonary resuscitation (CPR) and how a defibrillator works. A defibrillator can be used by anyone as the device gives instructions to guide the helper. What matters most for survival is how long it takes from the cardiac arrest until the start of CPR. 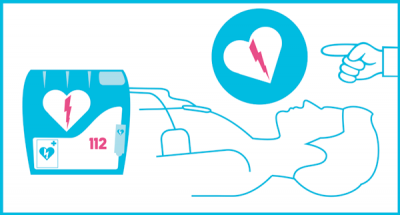 Effective CPR can maintain circulation to some extent, but any arrhythmias caused by a cardiac arrest can only be treated with an electric shock given by a defibrillator. If CPR and defibrillation start within 3 to 5 minutes, three out of four persons will survive even if they appeared lifeless to begin with. The device has picture instructions to help users attach the electrodes to a person’s exposed chest. 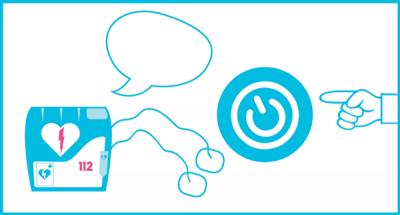 It also gives spoken instructions to guide the user. You cannot harm anyone by using a defibrillator. When giving CPR, you cannot do anything wrong. Call 112, start giving CPR and use a defibrillator if possible. If you do not know how to give CPR, the emergency response centre staff will instruct you.